Heya folks! Welcome to the second installment of All-Time Triber Uniform Number 8! We have some potential candidates in here, and some folks that probably feel lucky enough to have ever played the game at all. Such is the mistress we call the Majors! Jason Michaels - 2+ seasons (2006-Current) - Michaels came to the Tribe from Philly. In his first season with the Tribe, not only did he bat .267, but he was also selected by Indians as the Roberto Clemente Award winner in 2006. He donated the money to a local charity (the award comes with a $2500 check). Last year, he batted .270 will hopefully be able to keep it going. Jeff Liefer - 1 season (2005) - In 19 games, Liefer had 5 runs on 11 hits with 8 RBIs. 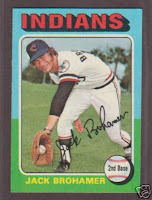 He also racked up 15 strikeouts, leaving the Tribe and his MLB career with a season finale .196 average. Joe Becker - 2 seasons (1936-37) - Becker wore #8 one season, then #10 the next. His entire MLB player career consists of 40 games with 83 at-bats. He had 20 hits, 13 RBIs, 5 doubles, 2 triples, and a home run. His .180 average in 1936 rose to .333 the next year for a career playing average of .241. After he left the Tribe, he went on to coach minor league and then serve as pitching coach for the Cardinals, Brooklyn Dodgers and other teams. Ken Keltner - 12 seasons (1937-44, 1946-49) - We first met Keltner wearing Number 6, and we will see him again wearing Number 9 for one season and Number 25 for 4-1/2. Keltner is recognized as the all-time greatest team third baseman. Remember, he is the one credited with the list of questions that "should" be asked of potential Hall-of-Fame inductees (the Keltner List)... While sporting the Number 8, he made four All-Star appearances (1941-44). Since we've already seen his overall stats in the Number 6 countdown, let's take a peek at his #8 playing days. In four seasons, he stepped up to the plate 2,205 times. He smacked 615 hits, scoring 276 runs with 292 RBIs. He also happened to get 137 doubles, 29 triples, and 46 home runs. We also have to take into account the 160 walks, 5 bean balls, and 141 strike outs. His batting average never fell below .260 and during the time he wore #8, his overall batting average comes to .278. Now, you don't become the greatest third baseman by just hitting the ball. During the same time period, he had 628 put outs with 1296 assists. That's 1296 assists in the 556 games in which he played. That's 2.33 per game. Oh, he also managed to get 135 double plays, while only committing 75 errors. All tolled, that's a 4-year average .963 fielding percentage. In case you've forgotten by now, this covers just PART of his career. 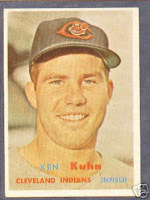 Kenny Kuhn - 3 seasons (1955-1957) - Kuhn spent his entire MLB career wearing Number 8 for the Indians. In 1955, he had 6 at-bats in 4 games. He had 2 hits and was walked once, netting a "career high" .333 average. The next season, he batted 22 times, getting 7 runs on 6 hits with 2 RBIs. But, 4 strike outs helped bring him down to a still-respectable .273. Unfortunately, in 1957, his average fell to .170 with 53 at-bats garnering 9 hits with 5 runs and 5 RBIs. The 9 strikeouts helped sink him, though was walked 4 times. He left the Indians with a career .210 MLB average. Les Fleming - 5 seasons (1941-42, 1945-47) - Fleming wore Number 23 for the first two seasons, then switched to Number 8 for the last three of his Indians days. He played in 2 games in 1941 and in 8 at-bats, he managed a .250 average. The next year, he served as the full time first baseman, batting in 156 games. His 160 hits with 71 runs and 82 RBIs, while getting 27 doubles, 4 triples, and 14 homers raised his average to .292. According to "baseballlibrary.com," he took a job in a 'war-related industry' in '43 and '44. 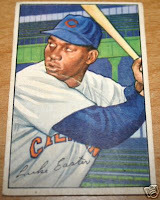 His return in 1945 brought him 140 at-bats in 42 games for a .329 batting average. 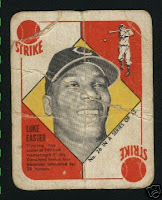 In 1946, he played in more than twice as many games, and essentially doubled many of his stats. Unfortunately, he increased his strikeouts nearly ten-fold, bringing his average down to .278. By 1947, his average had fallen further (to .242), and the Tribe sent him down the river to Pittsburgh. 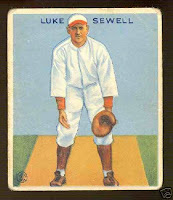 Luke Sewell - 13 seasons (1921-1932, 1939) - I am a nerd, and I freely admit it. One of the appeals of Sewell for me as a kid was the fact that he shared his first name with Darth Vader's love-child. We previously talked about Sewell's amazing Indians career in the #2 uniform, for which he was chosen the All-Time Tribe #2. He played the majority of his career in Cleveland before uniform numbers were even used. Though he has already won spot on the All-Time list, I wanted to remind you of just why he was chosen in the first place: Sewell entered the major leagues with the Indians, playing in 3 games and amassing a .000 average. Unlike other Indians who had accomplished the same feat, the Tribe stuck with Sewell. Sewell was not a full-timer until 1926, and he came out swinging - 103 hits, 46 RBIs, but no homers, netting him a .238 avg. The next year, he smacked for a .294 avg with 53 RBIs, 138 hits, 27 doubles and six triples. One of his greatest accomplishments came due to his ability to keep strikeouts to a minimum. In fact, he never struck out more than 27 times in any one season, even with 430+ at-bats in several! He was also very dangerous on the base-path. His LOWEST percentage for the Tribe was .333 whenever he tried to steal. In fact, the only .000 stolen base seasons (with the Tribe) were the ones where he did not even ATTEMPT a steal. His overall stolen base avergae is just under .500 whenever he attempted to steal during his Indians career, and he had several seasons in which he was attempting 10 or more steals per season. He holds the MLB record for playing 20 seasons as an active catcher. That's what I'm talkin' about! Manny Trillo - Part of 1 season (1983) - For some reason, I have it in my head that Manny Trillo played a stint for the Pirates when I was a kid, but his stats do not reflect that. I guess I have him confuzzed with another Trillo, perhaps? Oh well, Manny played in 88 games with the Tribe, getting 33 runs on 87 hits with 13 doubles, a triple, and a homer while scoring 29 RBIs. He was traded to the Expos, but he managed to get himself a spot on the AL All-Star team that year. He left Cleveland batting .272. Ben Henry (Baseball Card Blog) posted a trade request some time ago. For pre-1980 Topps, he'd send out a stack of cards. I sent him a handful or so of Pre-80 Topps I had laying around, and he sent me about 50 cards in return. I can't help feel like he got the short end of the stick, so I plan to take care of that! I believe most of the 'vintage' Topps I sent were Indians I had, but I think there was a 1978 Mike Schmidt, if memory serves. Don't worry Ben, there will be some more Pre-80's coming your way to help balance what you sent me! I have not run the cards through my database yet, but I know from looking at them that there are at least several that I need for my collection! There are many that I already have, but that is the fun of trading - you never know what you're going to get! Plus, many of ones I *do* have, I haven't looked at in quite a while, so it is fun 'waxing nostalgia.' Thanks a TON, Ben!! nmboxer asked a great question: Why DO players wear different jersey numbers anyway? There are a couple reasons that I can think of, but I welcome anyone to share their thoughts on the subject! For players that played around the time uniform numbers were first introduced, the POSITION of the player determined their uniform number. So, if a player was moved around the field, they may have worn a different number just because of that. Some players (like Thome, for example) have an affinity for a particular number (his is 25), but when they join a team, someone else may already have the number they want and for whatever reason, the other player will not swap numbers. Once that number comes open, then a player may switch. In a similar vein, if a player wears one number then leaves, another player may get his number. If he returns to the team, that number might not be available any longer, so he must choose a new one. If someone can think of other reasons, please feel free to comment. Joe Azcue - 7 seasons (1963-1969) - Remember, Azcue was one of the three finalists for the Uniform #6. 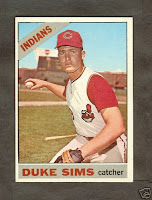 Here's the replay: He wore the Number 6 for his entire Indians career except for 1967, in which he wore Number 7. Azcue's 100 hits, 23 runs, and 42 RBIs earned him a spot on the 1968 All-Star team. He came to the Tribe in '63 from the A's, and he finished his first year in Cleveland with a .284 average. During his Indians career, he only had one season below .250, and five of his Indians' seasons were better than .270! His career in Cleveland gave him 1904 at-bats with 506 hits, 229 RBIs, 132 walks, and an overall average of .269. A couple of his interesting career facts include catching two no-hitters, and being the first person to hit into an unassisted triple play since 1927 (41 years) (July, 1968) - ouch. Joe Inglett - 1 season (2006) - Inglett played in 64 games with the Tribe, getting 57 hits on 201 at-bats. He scored 26 runs, 8 doubles, 3 triples, and 2 homers. Add to that 21 RBIs, 14 walks and 39 strikeouts, and you have a very respectable .284 rookie year. He left the Indians for the Blue Jays last year (2007). John Ellis - 3 seasons (1973-1975) - Ellis came to the Tribe from the Yankees. He batted .270 his first year, .285 his second, and .230 in his final year with the Indians. I remember a friend of mine having a catcher's glove with his signature on it as a kid (He served on the Spalding Sporting Goods advisory staff in the 70's). 1974 is often considered to be his best overall season: 136 hits with 477 at-bats, 58 runs, 64 RBIs, 10 homers, 23 doubles, 6 triples and a .285 average. In 1987, he founded the Connecticut Sports Foundation Against Cancer (http://www.sportsfoundation.org), which provides financial assistance to patients and families of those with cancer (He has lost a brother, sister, and sister-in-law to cancer, and is himself a cancer survivor). Johnny Romano - 5 seasons (1960-1964) - Romano wore Numbers 11, 9, 5, and 7 while with the Indians. 1967 was the only season in which he wore the Number 7. But, as with many of the Tribers in our look at the All-Timers, he will appear again. In case you have forgotten, here is what we saw at the Number 5: Romano scored 40 runs, 12 doubles, 2 triples, 5 home runs, with 52 RBIs on 86 hits during his first year with the Tribe (.272 avg). In both of the next two years, he played for the AL all-star team (21 homers in 1961 and 25 homers in '62). During his Indians career, he maintained a .460+ SLG except for one season ('63) which he had fractured his hand. It'll be fun to see where he stands in the #11 spot, since that's the number he wore the most often. 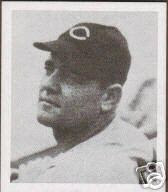 Jonah Goldman - 3 seasons (1928, 1930-31) - Technically, Goldman only wore #7 in 1931, since there were no Indians uniform numbers before that. For the sake of argument, I'll include all the years he played. 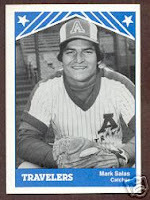 His three years with the Tribe were also the extent of his major league career. Overall, he scored 33 runs on 87 hits with 389 at-bats. He only had 1 home run and scored 20 doubles while bringing 49 RBIs and getting walked 35 times. He struck out 31 times, which means only 10 times per season on average. He left the Tribe with a .129 average in his final season and a .224 overall. Ken Suarez - 3 seasons (1968-69, 71) - Suarez did not play any full-time seasons with the Tribe. In '68, he batted in 17 games, then 36 in '69 and finally he batted in 50 games in '71. His highest career average was a .294 in 1969. Unfortunately, that was bookended by a .100 first Tribe season and .203 final season before being traded to the Rangers. In both '69 and '71, he had 25 hits, a home run, and 9 RBIs in each season. I'm not sure if there is a significance there, but back-to-back seasons where a player repeats stats in three different categories is pretty cool in my book. Mike de la Hoz - 4 seasons (1960-1963) - Wearing the Number 7 in '61 and '62, de la Hoz was first seen wearing Number 1 in our countdown. Throughout his Indians career, he posted near or above .260 average for each year with the Tribe, except for 1962. 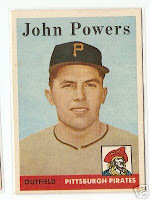 In 1962, he only had 12 at-bats and had one hit, posting just a .083 average. 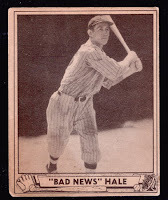 Odell Hale - 9 seasons (1931, 1933-1940) - Hale was seen in our Number 4 uniform spot, and will show up again wearing #'s 25 and 34. He only wore Number 7 during his rookie year. He played in 25 games with 92 at-bats that season. His 26 hits, 14 runs, 2 doubles, 4 triples, and single home run earned him a .283 average his first year in the majors. Not a bad start at all! Feel free to re-visit Number 4 for a review of his career. Phil Roof - Part of 1 season (1965) - Roof came to the Indians from the Angels after batting .136 in 9 games. Unfortunately, he did fare much better with the Tribe. In 52 at-bats (in 43 games), he ended his Indians-playing days with a .173 average, and was unceremoniously traded to the Athletics. While not very good while standing at the plate, he did very well while crouched behind it. In 41 games for the Tribe, he had 162 put-outs with 17 assists while keeping his number of passed balls to two. He left the Tribe with a .994 fielding percentage. Ed Wheeler - 1 season (1945) - Selected by the Indians in the Rule 5 Draft (winter), this is not the Wheeler that played with the Superbas. He batted in 46 games (72 at-bats) resulting in 12 runs on 14 hits with 2 doubles, 1 RBI, 8 walks and 13 strikeouts. His single year in the majors netted him a .194 average. 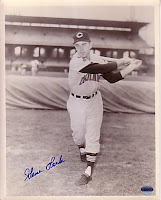 Gene Leek - 1 season (1959) - Leek came to the Tribe as a free agent and played in 13 games. He got 8 hits which resulted in 7 runs. He brought in 5 RBIs and hit a home run. He was walked only twice in his 36 at-bats, but struck out 7 times. He did not play in 1960, getting picked up by the Angels in the expansion draft. He left the Tribe with a .222 average and a .389 slugging percentage. Hal Jones - Parts of 2 seasons (1961-62) - Jones wore #7 in 1961, then switched to #15 in '62. In '61, he batted 35 times, getting 2 runs on 6 hits with 2 home runs and 4 RBIs. Unfortunately, he struck out 12 times, and his rookie average barely climbed past .170. At least the next year, he batted half as many times and raised his average to .313. 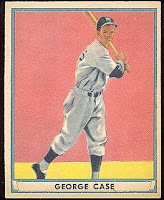 Hal Trosky - 8+ seasons (1933-1941) - Troksy batted in 11 games his rookie year (wearing #21), knocking 6 runs on 13 hits with a double, two triples, and a home run, bringing in 8 RBIs. He hit for a .295, so the Tribe put him in full-time after that. The next two years, Trosky batted in all 154 games, grabbing a .330 average and a .271 respectively. In 8+ seasons, HALF of those were .330 or better, and three of the remaining four were better than .290! In SIX of his seasons with the Tribe, he drove in 100+ RBIs per season. He was the "close buy no cigar" guy when it came to the all-star games throughout his career. He just never could muster up enough votes to get into the all-stars. Over the course of his Indians career, he knocked 1365 hits in 4365 at-bats. He scored 758 runs with 911 RBIs (216 home runs), while being walked 449 times and being beaned by the ball 15 times (that's almost twice a season). He also struck out 373 times. It is next to impossible to talk about Trosky without at least mentioning the "Crybaby" incident in which 10 players went to the owner to complain about the manager (Vitt). Trosky was not happy with Vitt, but believed confronting the owner about the situation was not warranted. Nevertheless, Trosky was pulled into the fiasco on the day of his Mother's funeral. The owner finally admitted that the accusations were well founded. His career suffered greatly because of his migraines. All that said, he retired early, after suffering years of intense migraine headaches. He left the Indians with a career batting average of .310, and on-base percentage of .376, and a .539 slugging percentage (remember, that's over an 8+ season career). Harley Boss - 1 season (1933) - Now, THAT'S a baseball name! Elmer (his first name) batted in 112 games in 1933. In 438 at-bats, he had 118 hits with 53 RBIs and 54 runs, 17 doubles, 7 triples, and a home run. He struck out 27 times and was walked just about as often (25 BB and hit by a pitch once). He left the major leagues with a cool name and a .269 average. 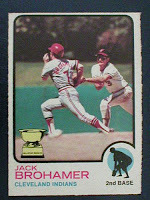 Jack Brohamer - 4+ seasons (1972-'75, 1980) - Brohamer was one of my favorites as a kid. He wore the #7 during his rookie year, then the #10 until 1976. When he came back in 1980, he donned #8. So, we will see him again throughout the countdown. As for his rookie year, he batted 527 times, getting 123 hits. He scored 49 runs with 13 doubles, 2 triples, and 5 home runs, driving in 35 RBIs. He finished his rookie year with a .233 average. We'll see how he stacks up as the countdown goes on. Jack Conway - 3 seasons (1941, '46-47) - We first saw Conway wearing #4, and we will see him again wearing #18. He sported the #7 during his last season with Cleveland. His 9 hits in 50 at-bats netted 3 runs with 5 RBIs. He was also walked 3 times and whiffed out 8 times. He left the Tribe that year batting .180, a long way from his 2 at-bat .500 rookie year. 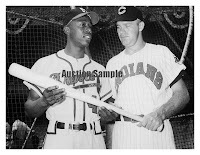 Jim Mahoney - 1 season (1962) - Mahoney (not related to the character in the "Police Academy" movies) wore #16 and #7 during his one-year stint with the Tribe. He had 74 at-bats in 41 games. Of those, he got 12 runs on 18 hits with 5 RBIs, 4 doubles, and 3 home runs. Striking out 14 times did not help, though. His Indians career average was also the highest of his four years in the majors, a .243 avg. Al Rosen - 10 seasons (1947-'56) - Rosen wore the Number 7 throughout his career, except for one (in which he wore #17). His career began slowly as he batted in 7 games his rookie year and ended up with a .111 average. His next season brought him a .200 average in 5 games and his third year netted him a .159 in 23 games. Things were not looking good, but the Tribe stuck with him and put him on the roster full time in his 4th year. He answered by batting .287 with a .405 OBP, and things proved solid from then on. Over the next 6 seasons, his average stayed at or above .265, with 3 of those seasons batting .300+. In fact, in 1953, he batted .336 and was unanimously elected MVP that year. During his career, he played in four all-star games and played with the Indians during their 1948 and 1954 World Series appearances. 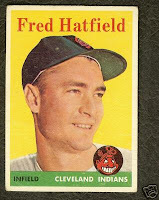 After injuries suffered in a car wreck and his treatment by the Indians management and fans (salary cuts despite great playing, and booing from fans), he retired in 1957 at the age of 32. Alan Bannister - 3 seasons (1981-'83) - Comedian Jimmy Pardo once said Bannister was his favorite player. Bannister averaged .265 over his three-year stint with the Tribe. He played in 286 games for the Indians, batting 957 times. During that time, he got 254 hits, 10 home runs, and 103 RBIs on 52 doubles and 6 triples. He struck out 103 times and was walked 89 times. He also had 40 stolen bases (16 in 1981, 18 in 1982, and 6 in 1983). Bernie Carbo - part of 1 season (1978) - Until now, I did not realize that Carbo only played part of one season with the Tribe (batted in 60 games). I always thought he had one of those cool baseball names. In his very short time with the Tribe, he racked up a .287 average, getting 21 runs on 50 hits with 4 home runs and 16 RBIs. He did manage to steal a base during that half season as well. He was so well liked in Boston, where he played before and after his time in Cleveland, that fellow player Bill Lee QUIT the Sox when Carbo was sold to the Tribe! Talk about friendship. 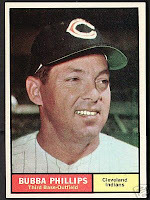 Billy Hunter - Part of 1 season (1958) - Like Carbo, Hunter was with the Tribe for only half a season (76 games). Unlike Carbo, however, Hunter only managed to hit a .195 average in 190 at-bats. One of his "now, that's weird" stats include his 37 hits and 37 strikeouts in the same time period. Even though he only got 37 hits, he did manage to score 21 runs on those 37 hits, and he had been walked 17 times. Doesn't really make it any easier to swallow, does it? Dang. Blas Monaco - Parts of 2 seasons (1937, 1946) - Now, you talk about a cool name, "Blas Monaco" sounds more like a movie actor than a baseball player, but it's still a great baseball name. In 1937, Blas wore the Number 7 while batting 7 times in 5 games. He got 2 hits with 2 RBIs. He struck out twice and was hit by a pitch. He ended the season with a .286 average and then was traded to Buffalo. I have no idea what happened, but he came back to the Tribe in 1946, he batted 6 more times. He scored 2 runs in '46 without any hits or stolen bases (he was walked once). I'm not quite sure how that happens. 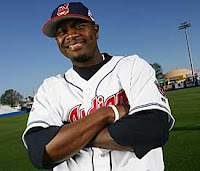 Brandon Phillips - 4 seasons (2002-2005) - Brandon split his Indians career between numbers 7 and 61. In 2002-2003, he sported the Number 7, which also happen to be his two best seasons with the Tribe. In truth, he only had one complete season (2003). In his rookie year, he had 31 at-bats, netting a .258 average with a .343 on-base percentage and a .419 slugging percentage. The Indians put him in full-time in 2003, and his batting slipped (208 avg/242 obp/311 slg). In 2004, his baseball days were numbered. He batted in 6 games for only a .182 average, and the next year, the Tribe had seen more than enough. Phillips again appeared in 6 games, but this time his average hit the bottom. His .000 season sent him to Cincinnati. Bubba Phillips - 3 seasons (1960-1962) - Phillips appeared previously in our countdown wearing Number 5. 1960 brought Phillips his worst season (.207 average). 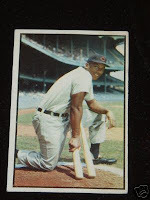 In 1961, though, he hit two grand slams (the only ones of his career) and batted his highest Tribe-based average (.264). In his three years as an Indian, he had 151 runs on 353 hits with 32 homers in 1412 at-bats, getting 159 RBIs. Buck Frierson - 1 season (1941) - Buck played in 5 games with 11 at-bats in 1941. He got 2 runs on 3 hits with 2 RBIs. He also struck out once and was walked once. He had a .273 average before being released. I could not find any specific information, but I can only assume Buck went off to fight in WWII and never returned to baseball. Cam Carreon - 1 season (1965) - Cam played in 19 games with 52 plate appearances. He got 6 runs on 12 hits with one homer. He had 2 doubles, a triple, was walked 9 times and struck out 6 times. Nearly 40 years later, Cam's son Mark (who appeared in our #4 countdown) would also don a Tribe uniform. Chris James - 2 seasons (1990-'91) - A utility DH for the Tribe, James batted .299 in his first year as an Indian and a .238 his second year before being sent to the Giants. His career in Cleveland netted 262 hits on 965 at-bats, scoring 93 runs with 17 homer runs, scoring 111 RBIs, leaving him with a .265 Tribe career average. Del Crandall - 1 season (1966) - Crandall came to the Tribe from the Pirates, playing in what would be his final season in the majors. He batted in 50 games, scoring 10 runs on 25 hits with 4 homers and 8 RBIs. He ended his only AL-playing season with a .231 average. Ed Montague - 4 seasons (1928, 1930-'32) - Montague had a respectable .262 career average with the Tribe. He wore #7 only in '32, but part of that comes from the fact that the Indians did not use uniform numbers before '31. Montague's lowest average was during his rookie year as he batted .235. His next two years netted .263 and .285 averages, respectively. He left the majors with a .245 in his last season. Overall, he had 105 runs on 161 hits while being walked 85 times and being hit by the ball 6 times. He was not a home run hitter, only knocking two of them during his 4 season career. Though his son with the same name is a major league umpire, baseball buffs may recognize the name as the scout who "discovered" Willie Mays and brought him to the major leagues.